There are so many things to love about Fall, but the thing that adventurers and nature lovers nationwide look forward to most is the leaves changing colors. The moment the air starts getting crisp, you can see leaves turning every fiery color under the sun. We here at Natural Blue believe in experiencing the beauty of nature in style. When you're showing off your favorite Natural Blue looks, you can't ask for a better backdrop than Fall foliage We compiled the best spots to take in the iconic Fall scenery. 1. Adirondacks, New York - It's hard to beat the foliage at this mountained New York area. With plenty of hiking trails and beautiful lakes, this location is best in early October. There's also a fantastic beer festival "Lake Placid Brewfest" the same time of year! 2. The Catskills, New York - Home of Woodstock, 35 mountains, any many charming bed and breakfasts, this other New York location will offer stunning Fall foliage. 3. 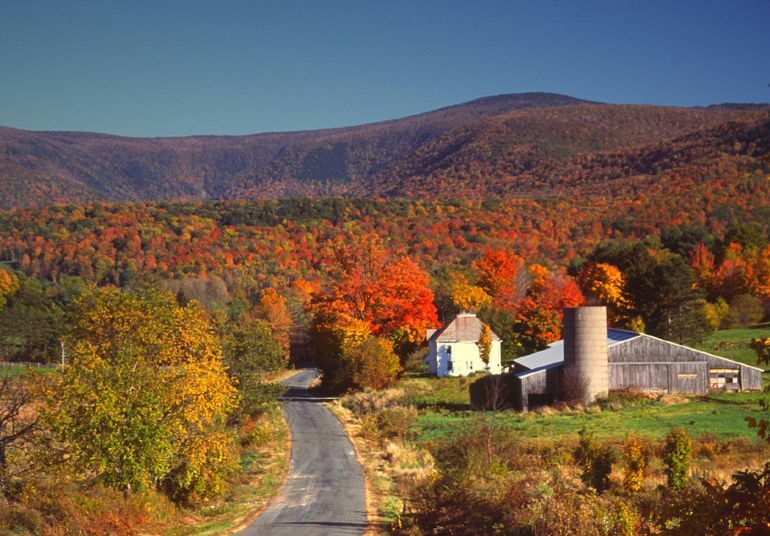 Berkshires, Massachusetts - Come for vibrant foliage and culture around Columbus Day. In addition to the scenery, this area is also famous for antiquing and spas. 4. Green Mountain Byway, Vermont - Take a drive at end of September for a stunning route through state parks and forests. 5. Ozarks, Arkansas - There are plenty of incredible hiking trails, lakes, and camping grounds. For peak colors, travel in the last two weeks of October. 6. Columbia River Gorge, Oregon - Foliage frames an epic waterfall and bridge at the border of Oregon and Washington, this spot will blow you away. It also offers kayaking and rafting. 7. The Poconos, Pennslyvania - This spot is amazing because not only does it offer a vast array of colored Fall foliage, its mostly flat terrain also allows for fun activities like fishing, golf, horseback riding, white water rafting, and mountain biking. Keep your eye out for festivals and fairs in early October! Go explore the best Fall foliage in the country and get your adventure on!